Gentleman that he is, Ben took the high road, let the comment slide, and simmered in silence. But later that night, alone with his wife, Marissa Hall, he started venting, surprising them both by how angry he was over the backhanded comment. On some level, he knew the dinner guest was not alone in her perception. It’s been several decades since bad boy tennis rock stars like Jimmy Connors, John McEnroe, and Andre Agassi had fired up the public’s imagination. And, sadly, the number of courts, clubs, and tournaments in the US has been steadily declining since then. At any rate, as the remark continued to resonate in his head, he decided to channel his anger into art, and write, direct, act, and co-produce Gentlemen’s Fury, a movie addressing the plight of the male tennis player. At first, he began writing a coming of age drama about the challenges of becoming a professional tennis player in a culture that defines masculinity in terms of financial success and/or brute power. But many drafts and a year later, he was forced to admit it wasn't working. In a frustrated conversation with co-writer Clint Gardner over lunch, he started joking about a tennis player getting thrown off the tour after a temper tantrum and making his way into a violent tennis cult. They say truer things are said in jest, and the more he thought about his comment, the more he sensed the possibilities. Working with Clint and Marissa, he began the rewrite, and quickly found his voice, which was midway between Fight Club and Dodgeball (the movie, not the sport). Realizing that creative control was paramount and that no studio in today's world would bankroll a project that they could write, produce, cast, act, and direct, Ben and Marissa took to Kickstarter to raise money. They came close but fell short of their goal. Refusing to give up, they relaunched the campaign. This time, they were successful, and were able to make the film. In retrospect, that confidence, coupled with their belief that creative people work well in relaxed, supportive environments, may have been responsible for one of the smoothest filming experiences you’re going to hear about. If an actor or crew member dropped out, another one effortlessly appeared. “Everyone was on time, people helped us out with food and locations, and many actors didn’t want to leave the set,” Marissa says. The proof of that is in the viewing. Clearly a labor of love, Gentlemen’s Fury works on multiple levels, with the broad comedy one expects, but also with an unexpected innocence and charm that harkened back to the best of the mainstream 20th century “b” movies of independent auteurs like Roger Corman and Hairspray-era John Waters. Gentlemen’s Fury was released on Vimeo On Demand on May 23rd, around The French Open no less. For more information and to see the film, please visit www. gentlemensfurymovie.com. Ben Sharples can most recently be seen in Takashi Shimizu’s horror film, Flight 7500. He is the co-writer and star of the short film Time Capsule, which premiered at Regards sur le Cinéma du Monde in Rouen, France as well as the director of Not Necessary, which won Best Comedy Short at the Action on Film International Film Festival. 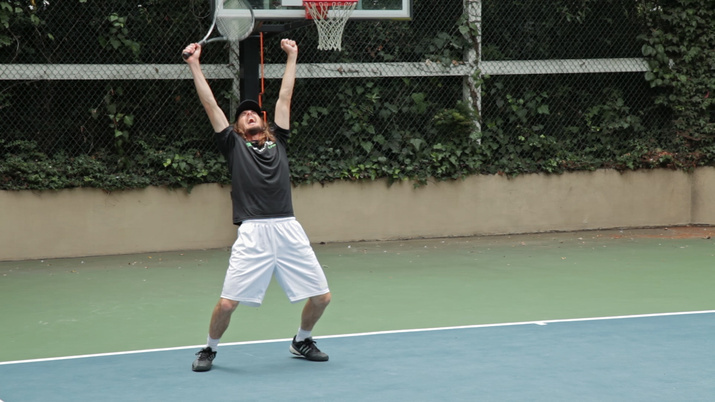 When he’s not making movies, Ben can be found on a tennis court. Marissa Hall spent a good part of twenty years in front of the camera acting in numerous films and commercials. She not only relates to the actors, she also knows how to treat them right. This time around, she split duties behind the camera with Ben.